Ride like a train aficionado by checking out the categories below. Hint: if you are traveling to or from Canada make sure you have all the documentation you need. Arrive early—it's a good idea to arrive 30 minutes before your train is due to depart especially if you are checking baggage. Please arrive one hour early if you will be crossing the United States/Canadian border. Check in at the counter to arrange for pre-boarding if you need assistance with wheelchair access, Business Class upgrade, checked baggage, or bicycles. Travel Documents Be sure you have all travel-related documents together before you leave for the train station. Be sure to bring your tickets and identification. Heading to Canada? Avoid delays by checking the latest travel restrictions before heading to Canada. Health and Medical Precautions If you or someone in your party takes medication, or has special health or medical needs, please contact Amtrak at 1-800-USA-RAIL for more information. Baggage Carry-on baggage is limited to two pieces per passenger (with few exceptions). Checked baggage service is available only at certain train stations. Be sure you understand our checked baggage baggage guidelines before leaving for the station. Seating On most Amtrak Cascades trains, seating is on a first-come, first served basis. Once onboard, the conductor may assign seats. Learn more about our seating accommodations. Get local traffic information in Washington and check Amtrak Cascades train status. Check the latest travel restrictions before heading to Canada. Traveling over the United States/Canadian border requires specific identification and there are other laws you may need to comply with. Passengers traveling on Amtrak Cascades across the U.S./Canada border are subject to inspection by Canadian and American law enforcement officials. When entering the United States, travelers must inform U.S. Border inspectors of all fruits, vegetables, plants, plant products, live animals, meats and animal products, regardless of whether they are allowed. Read Bringing Agriculture Products to the United States from Canada (pdf 80kb) for more information. Signed copy of IRS form 4029, application for exemption from Social Security and Medicare taxes and waiver of benefits. Amtrak policy does not allow children 14 and under to travel unaccompanied into Canada, regardless of ID or notarized letter. Form I-551, permanent resident card. A foreign passport may also be presented, but the form I-551 is required. The Bistro Car offers a variety of fresh, local foods and beverages including soups, sandwiches, sweets and snacks, as well as alcoholic and nonalcoholic beverages. Dine at one of the booths, sit at the counter, take food back to your seat, or relax in the Lounge car. The Bistro is wheelchair accessible and features panoramic windows. Amtrak Cascades is proud to feature products grown and made in the Pacific Northwest. Local favorites are featured on our Bistro Menu (pdf). The Lounge Car is one of the best places to enjoy the passing scenery, with casual seating for 30, available on a first-come basis. Eat, read, or play a game at one of 10 tables. The Lounge car is wheelchair accessible. If you're looking for a little entertainment with your relaxation, you're in luck. You may bring and use onboard personal electronic devices such as laptop computers, DVD players, and CD players (be sure to use headphones). Standard 110-volt electrical power outlets are available right by your seat to supply power to your electronic devices. Please consider the comfort of others, particularly when your coach is crowded. Use earphones or headphones when listening to audio/video devices. When using your cell phone, please be considerate of other passengers around you. For calls of longer duration or louder tone, please use the vestibules between cars. Do not leave children unattended. Use seat backs and handrails while walking through the train. Wear shoes at all times and use caution when wearing non-rubber soled shoes. We offer the best baggage policy; four free items! Passengers may carry two personal items, 25 lbs. (12 kg) 14x11x7 inches each, such as small bags, backpacks, purses, laptops. Personal items can also include neck pillows, blankets and outer garments. Each passenger may bring two bags; each bag weighing 50 lbs. (23 kg) or less, and measuring 28 x 22 x 14 inches or smaller. Each passenger can check up to four bags. Two free of charge and two more for $20 per bag, each of which may not exceed 50 lbs or be larger than 75 linear inches (length + width + height). Oversize bags between 75 and 100 linear inches can be checked for $20 per bag. All baggage, both carry-on and checked, must be visibly tagged with your name and address. Amtrak staff has baggage tags available if you need them. Amtrak Cascades checked baggage service is available at: Albany, Bellingham, Centralia, Edmonds, Eugene,Everett, Portland, Salem, Seattle, Tacoma, Vancouver, B.C. *, and Vancouver, WA. If you are checking baggage, please arrive at the station 45 minutes early. *If you are checking baggage in Vancouver, B.C., please arrive one hour in advance of departure. Checked baggage service is available during hours of operation at staffed stations. Visit the specific stations webpage for specific station hours. Free "Red Cap" service is available to help with your bags in Seattle and Portland. Checked baggage is not available at Olympia, Tukwila, Kelso, Ocean City, or Stanwood stations. A $20 excess baggage fee will be charged for each carry-on and personal item above the quantity and size limits. A maximum of two excess bags are permitted per passenger. The fee will be collected at the station or if unstaffed, onboard the train. If checked baggage is available, passengers can check two bags free of charge to their final destination. Checked baggage is not offered on all trains and stations, so please check with Amtrak to see if checked baggage is available throughout your journey. Amtrak reserves the right to deny transport for items exceeding policy limitations. All baggage, both carry-on and checked, must be visibly tagged with your name and address. Amtrak staff has baggage tags available if you need them. Carry-on purses, briefcases, laptop cases, diaper bags, strollers, car seats, cosmetic cases, or equipment required for a medical condition do not need name/address tags. Once on board the train, carry-on bags may be stowed in overhead bins or baggage rack. Safety rules require that all bags be stowed in designated baggage areas and kept out of aisles, walkways, and vestibules. Please bring only luggage you can lift overhead without assistance. Baggage is not allowed in the Bistro and Lounge cars. The complete baggage policy is available at Amtrak.com. Make a reservation for both you and your bike aboard Amtrak Cascades. There are two options for bringing your bike – you can use one of our onboard bike racks, or box your bicycle and check it as baggage. Ten bike racks are available on each Amtrak Cascades train. Bike racks are very popular and reservations are required. The cost for reserving space in the bike rack is $5. Bicycle racks will not accommodate tandem, recumbent or other unusual bikes. Such bikes must be transported as checked baggage in a box. Special items such as sports equipment, strollers, etc. are allowed on the train. Amtrak accepts a number of special items such as baby strollers, golf bags, musical instruments, snowboards, and skis (one board or set per bag/container). Special items (such as skis, golf bags and surfboards) must be properly packed and visibly tagged. In most cases there is a handling charge of $10 to $20 per special item. Contact 1-800-USA-RAIL (1-800-872-7245) for more information. Amtrak allows firearms and ammunition to be checked as luggage between staffed stations. Carry-on firearms and ammunition are prohibited. Visit Amtrak.com for more information about firearms in checked baggage. Incendiaries, including flammable gases, liquids, and fuels. Large, sharp objects such as axes, ice picks, and swords. Corrosive or dangerous chemicals or materials, such as liquid bleach, tear gas, mace, radioactive and harmful bacteriological materials. Batteries with acid that can spill or leak (except those batteries used in motorized wheelchairs or similar devices for mobility-impaired passengers). Club-like items, such as billy clubs and nightsticks. Animals (except service animals and small pets allowed per the Pet Policy). Consumption of personal alcohol is strictly forbidden. Please note: This is not an exhaustive list. Any item similar to those listed, even if not specifically mentioned here, is prohibited from being carried onboard or checked as baggage. Reports for lost or misplaced items left on trains or in stations must be submitted within 30 days of travel. For best results, submit your report at your arrival station; otherwise, call Amtrak at 1-800-USA-RAIL (1-800-872-7245). A thourough description of the lost item, including a description of the size, color, brand, condition and any other distinguishing features. Your date or dates of travel. Your departure and arrival stations. Your trains names and numbers. One child age 2-12 is eligible to receive a 50% discount on the lowest available adult rail fare on most Amtrak trains with each fare-paying adult (age 18+). If any additional child per adult will be traveling, reservations must be made for that child as an "Adult" and the full adult fare will be charged. One child (classified as an "infant") under the age of two may ride free with each fare-paying adult (age 18+). Additional children under age two are permitted with each adult traveler under the 50% discount policy. An infant traveling free may occupy a vacant seat only if the seat is not needed for a paying passenger. Conductors may require that infants occupying a seat without paying a fare may have to sit in the adult's lap to provide seating to a fare-paying passenger. Passengers 12 years of age and younger must travel with an adult passenger who is at least 18 years old. Children traveling alone are not entitled to a children's discount. The children's discount does not apply to Business Class. These upgrades are permitted upon payment of the full accommodation charges. The children's discount is not valid for travel on certain Amtrak Thruway connecting services. Children 13, 14 and 15 years old may travel as unaccompanied minors only under certain conditions. Reservations for unaccompanied minors cannot be made on Amtrak.com. Additional rules and restrictions apply. Visit the Unaccompanied Minors policy page for full details. All travel must take place on the same day with the scheduled departure time no earlier than 5:30 a.m. and the scheduled arrival time no later than 9:30 p.m. Overnight travel is not allowed. For each unaccompanied minor traveling alone, the adult (at least 18 years old) bringing the child to the departure station must complete and sign a release form. Both the adult and the minor must be at the boarding station at least 1 hour before the train’s departure time. The child must wear an Amtrak issued wristband for the duration of travel. The adult must remain at the station until the train has departed. Upon arrival, an adult (at least 18 years old) must be present to pick up the child. The adult must display valid current identification meeting the Amtrak ID policies. The unaccompanied child may not have any life-threatening food allergies. 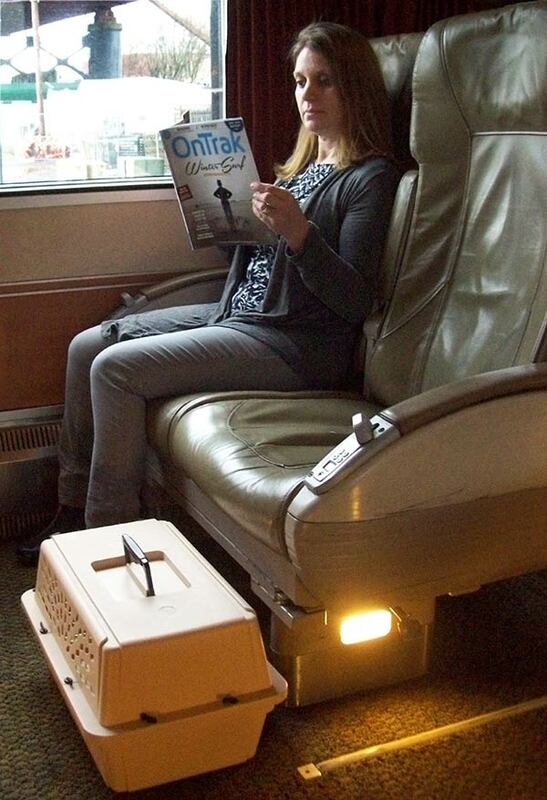 You can take your small dog or cat along with you on Amtrak Cascades trains. Now that Rover can come over, we hope to see you and your pet onboard. Please refer to the guidelines below. Other restrictions may apply. Please note these guidelines do not pertain to service animals. Cats and dogs are the only types of pets accepted. Only one pet and one carrier per passenger will be allowed. Maximum combined weight of pet and carrier = 20 lbs. Maximum length of travel on the train will be seven hours. Passengers making connections must complete travel within seven hours from leaving their train station. Pet reservations can only be made with a reservation agent at 1-800-USA-RAIL or at a staffed station. Pet reservations are made on a first-come, first-served basis, and may sell out quickly, so we strongly encourage you to make your pet reservations in advance. Pets are only permitted in Coach cars. Only one pet per passenger will be allowed, and no more than five pets are reserved per train. Service animals do not count towards this limitation. The pet fare is $26 per reservation ($52 round trip). No pets allowed into Canada. Pets are not permitted to travel with unaccompanied minors. Pets are not permitted on Thruway or POINT bus services. Multi-ride, monthly, and Rail Plus tickets cannot be used in conjunction with pet reservations. All passengers traveling with a pet must reserve a Coach seat and pay the applicable fare. At staffed stations, passengers must check in at the station ticket office no later than 30 minutes before train departure time in order to allow sufficient time to confirm pet eligibility and complete a Release and Indemnification Agreement. At unstaffed stations, the conductor will confirm pet eligibility and provide passengers with a Release and Indemnification Agreement to sign on the train. A waiver must be completed for each leg of travel. Pets are only permitted in Coach car #4. Passengers must remain with pets at all times. Pets must remain inside their carrier at all times and may not be removed from their carrier while in stations or onboard trains. Passengers must keep their pet carrier on the floor in front of the seat next to them. Pet carriers are not permitted on train seats. As noted, pets must remain in their carrier and on the floor. Pets cannot be on seats; and being in front of the aisle seat rather than the window seat keeps them safely away from the heater which could become too hot for their comfort and safety. Pet owners must provide their own pet carrier. The maximum size for pet carriers is 19" long x 14" wide x 10.5" high. The carrier may be hard or soft sided but must be leak proof and well ventilated. For safety reasons, pets must be able to sit and lie down comfortably without touching the sides of the carrier. A carrier counts as one piece of carry-on baggage. Pet must be at least eight weeks old. There isn't time for potty breaks at stops, so please ensure your pet gets a potty break before departure. Pets must be odorless and harmless, not disruptive, and require no attention during travel. Amtrak maintains the right to refuse acceptance of, or remove from the train, any pet exhibiting these issues. Passengers will be required to certify that the pet is up to date on all vaccinations and accepts liability for animal. The maximum weight of your pet including the carrier is 20 pounds. Amtrak will not accept liability for the health and well-being of pets. Note: In the event of a service disruption, Amtrak will make reasonable efforts to seek (but cannot guarantee) pet friendly hotel accommodations, if sheltering is necessary. Our goal is to provide safe, efficient, and comfortable service to all of our passengers. We are pleased to provide additional services to passengers with disabilities. Each Amtrak Cascades train has space for at least four mobility-impaired passengers. Braille signage is available throughout the train and audio and open captioning for travel information is provided on all overhead monitors. Visit our Accessibility page for more information. Everyone can travel on Amtrak Cascades. Our goal is to provide safe, efficient, and comfortable service to all of our passengers. We are pleased to provide additional services to passengers with disabilities. Each Amtrak Cascades train has space for at least four mobility-impaired passengers. Braille signage is available throughout the train and audio and open captioning for travel information is provided on all overhead monitors. Amtrak Cascades is one of the most accessible passenger trains in the world with features accommodations for four mobility-impaired passengers on each train. 1-800-USA-RAIL (24 hours a day/7 days a week) or TDD/TTY at 1-800-523-6590 (Eastern time, 5 a.m. to 1 a.m./7 days a week). Reservations and tickets are available at staffed Amtrak Cascades stations: Vancouver, B.C. ; Bellingham; Everett; Edmonds; Seattle; Tacoma; Centralia; Vancouver, WA;Portland; Salem; Albany; and Eugene. Pay for your ticket once you're on the train, if you boarded at an unstaffed station or were unable to pay beforehand because of a disability. The onboard purchase fee will be waived for passengers who had no way to purchase tickets in advance. We allow trained service animals accompanying passengers with disabilities in all customer areas in our stations, trains and Amtrak Thruway motorcoaches. Trained service animals must be kept under the control of their owners or trainers at all times. For all other critters, please view our new Pet Policy. Amtrak Cascades offers a 15% fare discount to passengers with mobility challenges and to their adult companions (16 years or older). Please request the discount when making reservations. These discounts cannot be combined with other available discounts. Persons with Disabilities placard issued by a state department (Department of Licensing or Department of Motor Vehicles). Note: If the documentation does not contain a photograph, photo identification may be requested. We know how much you love bicycling — it’s just part of the Pacific Northwest culture. That’s why we’ve made it easy for you to take your bike along on your next trip aboard Amtrak Cascades. Ten bike racks are available on every Amtrak Cascades train. Bike racks, located in the baggage car, must be reserved for a cost of $5 each. Book early to ensure bike space is available and you get the best fare for your own ticket. This is particularly important during busy summer months when trains fill up quickly. If you don’t make advance reservations, you may find the bike rack space is all sold out. If that’s the case, you can opt to box your bike (except at unstaffed stations)* for an additional $15/box plus a $10 handling fee. You’re responsible for disassembling and reassembling your bike. Remember to bring your tools along. Looking for some great bike rides along the Amtrak Cascades route? Check out our bike brochure for ideas on where to head for your next bike adventure.